When workers at the West Linn Paper Co. mill went on strike during the 1960s, DeJardin routinely loaned them money to help them cover housing and food costs. Before there was the internet or television, people listened to their favorite shows, the news and musical programs on the radio. West Linn Historical Society board member Larry McIntyre has re-created radio listening for us with his "KWL Radio Show," which will be performed live at the Youth Music Project Meteor Lounge. McIntyre's attention to detail celebrates a time in history when radio programming included soap operas, talk shows, storytelling, music and, of course, the news and weather. All of the programs were sponsored by national brand products and local businesses, like Duz laundry soap, Kellum Motors of Gladstone, and DeJardin's Thriftway of West Linn. What? You don't remember DeJardin's Thriftway? For decades, DeJardin's Thriftway was the place to shop in West Linn. Deals were abundant and Lester DeJardin was a philanthropic pillar of the community. When asked to sponsor an event or a sports team, he rarely said no. 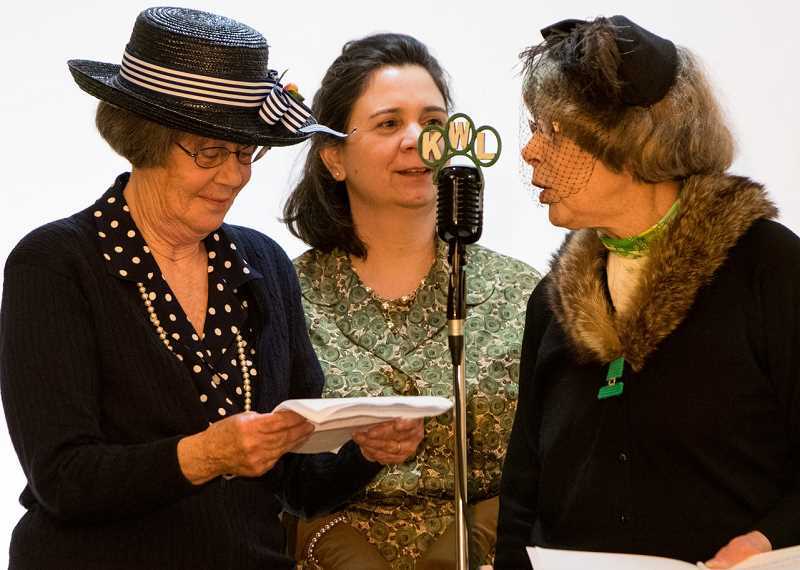 WHAT: The West Linn Historical Society presents a live vintage radio show depicting life in West Linn in the 1950s. When the occasion called for it, he was known to have coffee and doughnuts delivered to picketers, bags of groceries delivered to a family in need, or would anonymously pop a couple of extra items into a customer's grocery bag. As a Lion, DeJardin often gave cash donations anonymously to one of the club's sponsored services. To this day, the West Linn Lions receive a yearly donation through a trust set up by DeJardin. In 1945 DeJardin bought Heath's Grocery, which was located on the main floor of the West Linn City Hall building at 22825 Willamette Drive, and known to many now as the old police station. He changed the grocery's name to Thriftway and operated the store there for 10 years. In 1954, DeJardin's Thriftway moved out of the City Hall building to a new location on Hood Street, where Market of Choice is now. When the freeway was built in the mid-1960s and wiped out West Linn's downtown, DeJardin's store survived because of his passion and dedication. After DeJardin died in 1977 the family continued to operate the business until 1996, when United Grocers of Portland bought it. "That company's agreement to invest $2 million to upgrade the store was not fulfilled," said DeJardin's daughter, Carol DeJardin. "United Grocers never put a dime back into it. If you stop reinvesting in your store, it's only a matter of time before customers start going elsewhere." Although the store closed in 2003, ending a business legacy that began five decades earlier, DeJardin's contributions to the community were numerous. To honor the man who lived a life of giving, creativity and service to others, the West Linn Lions established the Les DeJardin Community Service Award in 1978. The award is presented to an outstanding community volunteer who might otherwise go unrecognized. Sources: West Linn Tidings June 13, 2018; West Linn High School Amplifier August 1985; The Oregonian March 27, 2003; internet article City of West Linn Historic Context Statement Willamette and Holly Grove Neighborhoods summer 2006, prepared by K. Fitzgerald.